These 1/4in. 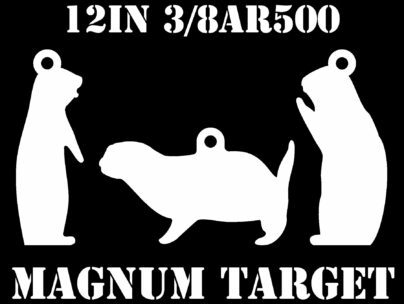 thick A36 Steel Targets are manufactured to meet NRA specifications for small bore rifle shooting. Steel Targets are precision cut with a CNC plasma cutter and submersion water cooled, during the cutting process to maintain the integrity of the steel, ensuring the longest life. Targets are assembled with professional heavy duty welds extending the full length of the contact area of the base. Steel Targets can be placed on and shot from any safe flat surface. Reversible Target face doubles the life of the Steel Target. I just ordered a second set! I use these with a .22cal air rifle. We do our own version of Silhouette/field target shooting, from 20yards out to 100yards. They come ready to use. Well constructed. You will need fast drying white spray paint!